Getting information from your project to your computer can be difficult at first. Once you discover how to setup an RS232 connection, it's really just cut-and-paste for future projects. Now let's discuss what's going on here. The barrel jack (J1) is a basic 5.5mm OD 2.1mm ID type jack. We get an unregulated 9-13V out of the wall wart. The D3 large diode MBRA140 is for reverse protection. It can handle up to 1A and prevents damage to the board if a center-negative wallwart is attached. This diode will cause a ~0.5V drop from whatever the wall-wart is outputting. C2 (10uF Tantalum Capacitor in this case) is a basic decoupling cap. 10-100uF is adequate but should be rated for 15-25V. U1 is the LM317 (or LM1117 in SMD form) adjustable voltage regulator. It will take in some larger voltage and output a set voltage. The output voltage is set with two external resistors. R1 is historically 240 and value for R2 is different for different required output voltages. In our case, we want 3.3V out of the regulator, so R2 is set to 715. 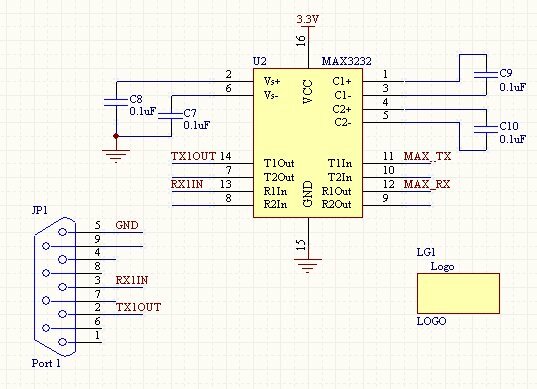 The LM317 is good because it is variable, the SOT-223 package is nice becuase it can take a relatively large voltage on the input (25V max I believe?) and has decent heat dissapation. C1 and C3 are decoupling caps that help clean up the output transcients and noise. 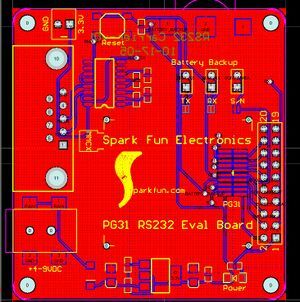 J2 is just a two pin polarized header so that you can either 'steal' 3.3V from the board to power other boards, or have other boards power this board without the need for the external wall wart. Now read-up on the MAX232 IC. It could be the most common IC out there, at least for the embdded world. This IC will have many different model names (ICL232 for example) but all do the same thing, and will most likely have identical pin-outs. This IC is used to take low voltage signals from your micro or PIC or ARM or whatever, and converts those low-voltage signals to higher-voltage signals that the computer can understand. The voltage levels on TTL are also inverted for RS232 so the MAX232 takes care of that as well! So in this application, the GPS unit is running at 3.3V. If we were to send 5V TTL to it, it would be damaged! So we must use the lower voltage MAX3232 part. No big deal, it's functionally identical to the MAX232. From here on out, I will only refer to the MAX232. When you first view the MAX232 component, it can be a bit confusing. The pins label T1/T2 are the transmit channels (MAX232 has 2 TX channels and 2 RX channels). T1In/T2In will take *in* TTL and send *out* RS232 out T1Out/T2Out. So for our purposes, we need to connect the GPS unit's serial TX pin to the T1In pin of the MAX232. So when the GPS unit outputs some 3.3V TTL signals, these signals will be converted into RS232 and sent to the computer (TX1Out is connected to pin 2 on the DB9 connector). 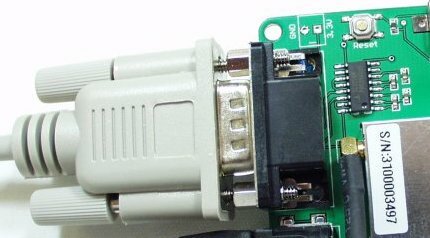 Finally, when the computer needs to send info to the GPS unit, it will send RS232 signals down the serial cable, on pin 3 of the serial cable/DB9 connector to R1In of the MAX232. 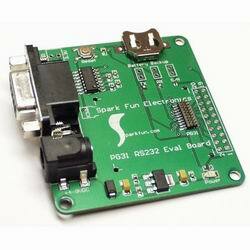 This RS232 signal will be converter to TTL and sent out the R1Out pin. This TTL signal is connected to the RX pin on the GPS unit. Voila. I can't tell you how many times I've crossed TX and RX on different projects. Sit down, think about it, and once you've got it wired correctly, cut and paste into future projects. 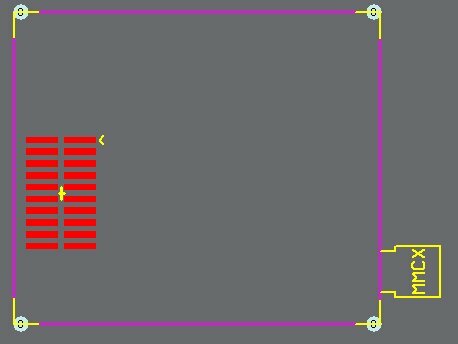 You can see the PCB layout is pretty straight forward. The 'solder jumpers' are a feature that SFE came up with to minimize our manufacturing time while allowing end users to populate the physical jumpers if they needed the ability to connect/disconnect a feature often and quickly. Most users just plug the PG31 onto their computer for quick evaluation. At some point, the MAX232 may need to be disconnected from the circuit so that an external micro or embedded system could be attached. If this is done back and forth often, the end user can clear the solder jumper with a swipe of the soldering iron, install a 2-pin header and a black plastic jumper. This now allows them to jumper/dejumper quickly and keeps us from having to solder the 2-pin headers into a board that may not need them. This page was last modified on 30 December 2007, at 22:27. This page has been accessed 78,091 times.